The Khan. 2010-2016. C-print on archival paper. ©️Rana ElNemr. In this conversation, over three rich meals and one virtual encounter, artist Rana ElNemr and journalist Lina Attalah discuss how ElNemr became a visual artist, the process of decision-making in creating artworks — complete with conversations with imaginary audiences — and developing an ability to talk about them afterwards. They touch on the fear of being categorized in a particular genre, on the importance of being attentive to intuition, and on maps, clichés, curiosity and more. They also take us on a conversational tour of ElNemr’s solo show A Chapter of Synonyms, on display at the Beirut Art Center until March 26, curated by Marie Muracciole. 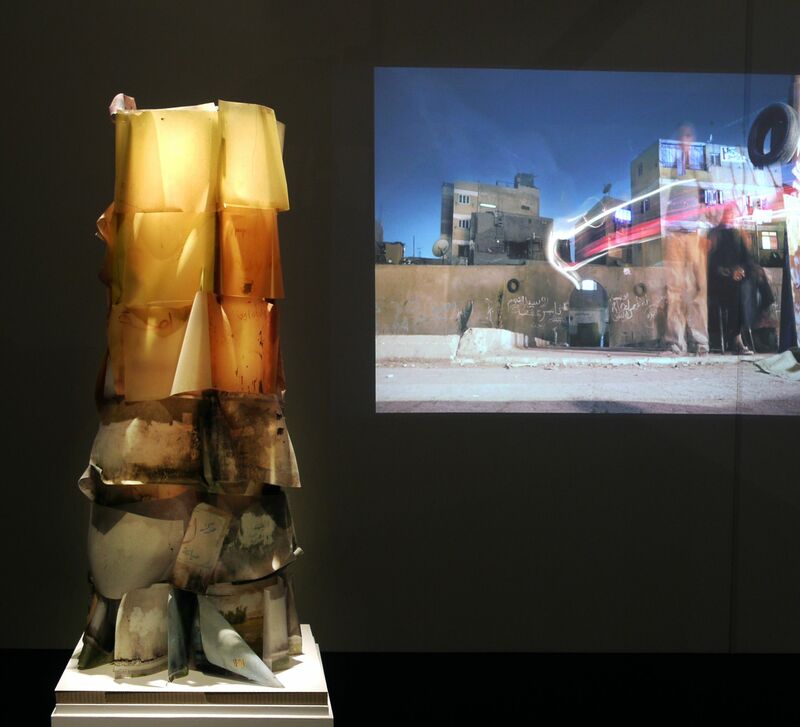 The show is an evolution of Assembled in Streams of Synonyms, exhibited at the American University in Cairo’s Sharjah Art Gallery in 2014 and curated by Maha Maamoun. Lina Attalah: How did your formal training open the way for a more open-ended artistic practice? 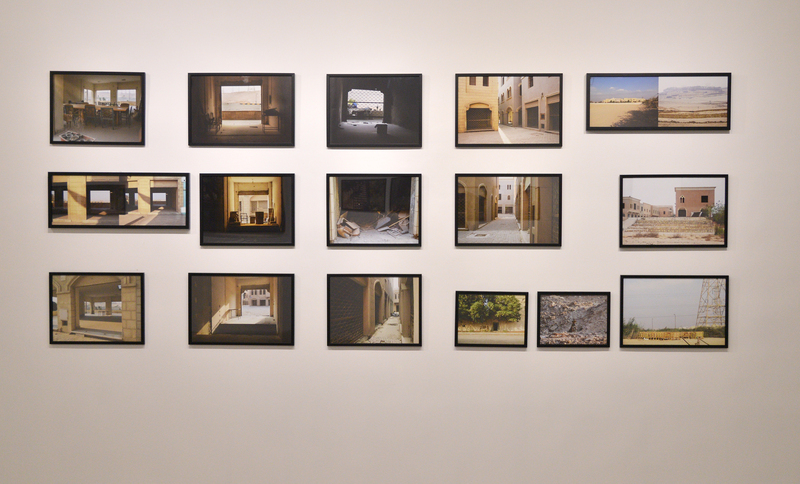 Rana ElNemr: I studied photojournalism and advertising as a major, minoring in arts. Between photojournalism and arts as two specializations, I kind of created my own formula, taking from here and there, in an organic way. I was influenced by the circumstances and resources available at the time. For example, I would freelance for a lot of the monthly magazines that sprung up in the end of the 1990s and the beginning of the 2000s. I’d see photographic exhibitions in contemporary arts spaces. I would participate in photography workshops, mainly at Goethe Institut and the Townhouse Gallery. The first workshops I attended were led by documentary photographers, even if the workshop itself was on something else. I had no training in contemporary art the way I practice it today. In that sense, I can say I’m very much self-taught, with backgrounds in classical arts, photojournalism, media and advertising. Today, as an artist, the more challenging it becomes to understand, to express, to articulate, to question, the more versatile tools I need. I’ve been continuously adding more tools to my kit. By tools I mean mastering one genre of photography, then mastering other genres of photography; but also moving from a still image practice to a still and moving image practice, and from two-dimensional mediums to three-dimensional ones, from visual only to visual and audio, or audio on its own and from addressing the signified to addressing the signifier. 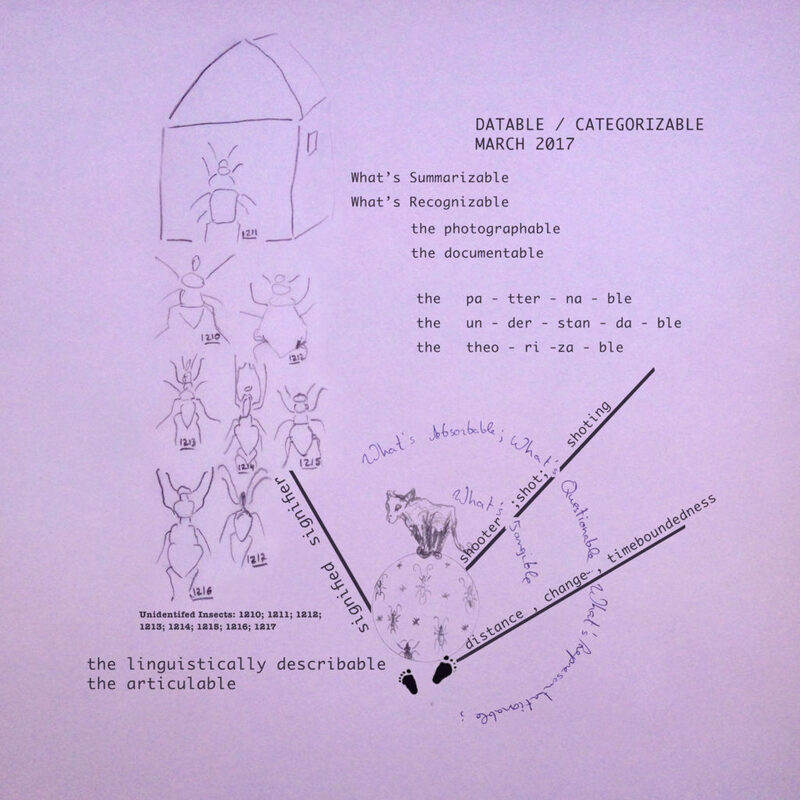 Datable / Categorisable. 2017. Pencil sketch on paper with printed type. ©️Rana ElNemr. 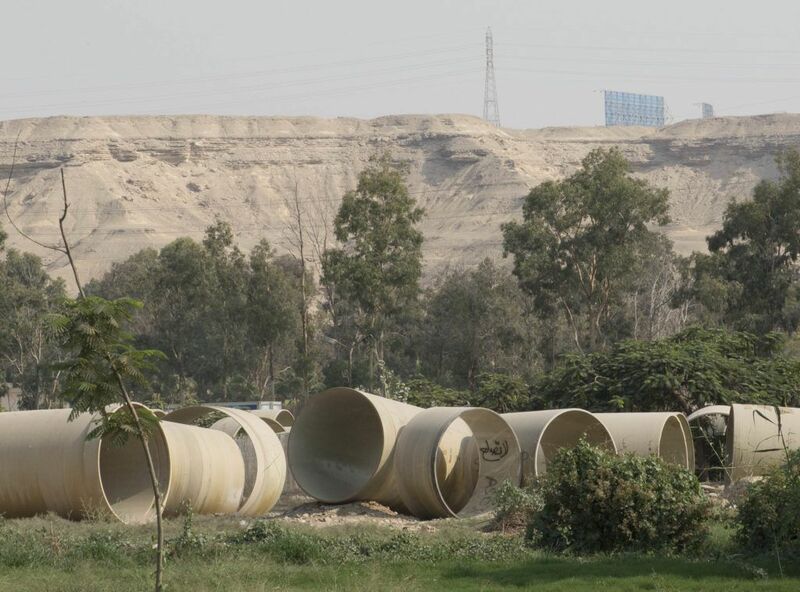 LA: How does living in Cairo and being from Cairo inspire or affect different ways of seeing? Is this context essential to your artistic project? REN: Until very recently, I thought my approach and process were not really transmittable when I temporarily relocate, but I’ve started to change my mind about that. I realized that the way I work in my home city and country allows me the privilege of understanding a lot of very embedded codes, and that this is the main difference between working here and elsewhere. But where I’m working has a similar effect to when I’m working, what my current thoughts are, outside factors related to the art world, the political situation, etc. All these and many other factors affect how I approach a certain work. The privilege of knowing the language or culture or geography becomes minimal when compared to all these other factors, particularly when the tools I use grow according to my needs. For example, my interest in internet-based image production, dissemination and aesthetics is not solely approached through my presence in Egypt. Likewise, when addressing aesthetics and visual languages produced in a specific historical, intellectual and popular context, capturing images that use these aesthetics at a different time, and in a different cultural and intellectual context, exposes a lot about them, adding to what is revealed by images capturing the context they originated from. So I see factors like time, location, age, scene, position in that scene, knowledge, information, network, technical abilities, skills, tools and collaborations as a large pool that sets the parameters for how my work can develop and how it is finally produced and viewed. LA: In working with spaces, you take interest in what you call “urban projections” and “imaginary exchanges,” creating a whole new potentiality and unearthing different layers to or in relation to them. 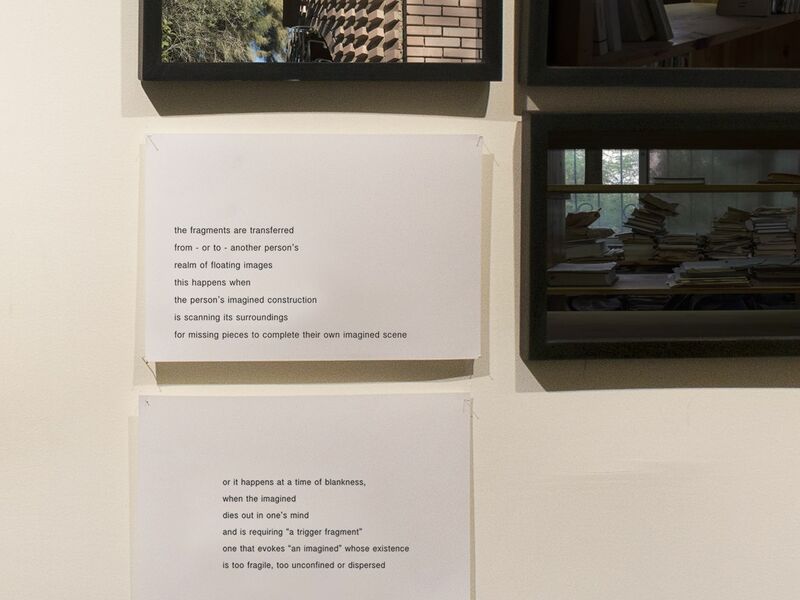 REN: “Urban projections” and “imaginary exchanges” are terms chosen by Marie Muracciole, curator of A Chapter of Synonyms, in the exhibition text. They refer to the constant reminder, as she writes, that images are only readable in reference to a framework of knowledge. This is also true while shooting: spaces are only readable in reference to knowledge and experience, but there is also a third dimension (depth) and a fourth dimension (time), and an extension of the viewing — sound and other surrounding and overlapping scapes. LA: How do the formal details of a space connect with these dimensions? REN: These exchanges may take place in the space, some on an imaginary level, and some on a very real and physical level. Photographs, by nature of the medium, emphasize the formal aspects of a space, making it difficult or impossible to capture these exchanges across dimensions, levels and scapes. 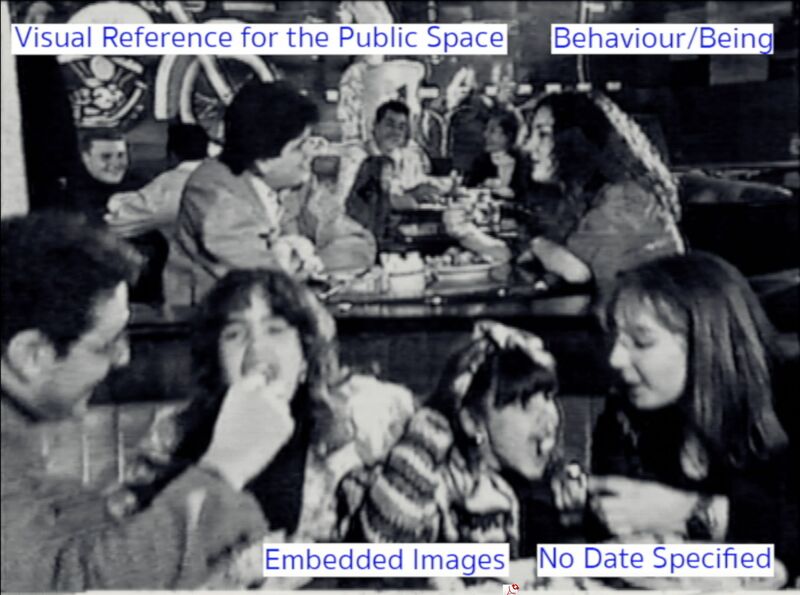 Several photographs together, however, particularly when varied in sizes, visual languages, aesthetics and approaches, can re-create connections and recall exchanges. 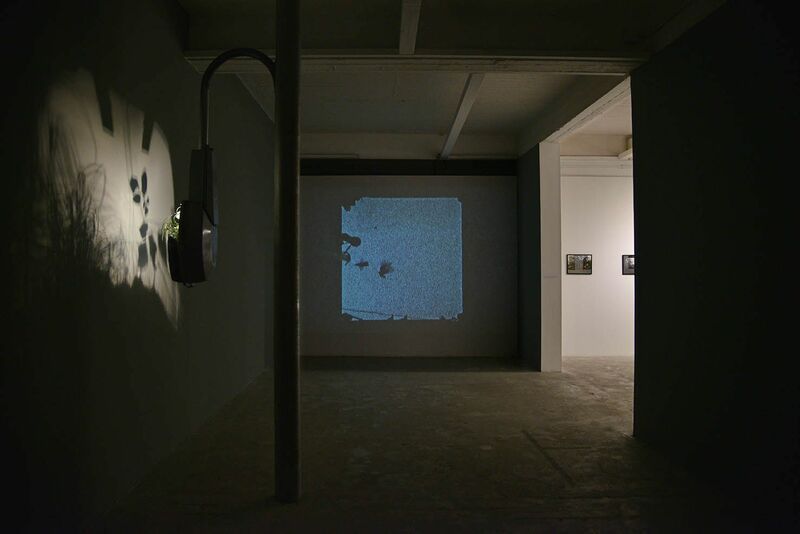 In the context of the show itself, photographs, objects, sculptures, audio, video and text interrupt formal representations, not only to create and recreate such exchanges between works and the spaces captured by the works, but also to impose pauses, and occasionally voids, around and between the works, a potential for bringing in the viewer’s personal framework. LA: Let’s talk about how, and to what extent, your work challenges fixity in spatial and urban photography and associated visual representations. REN: Visual representations of a space can change as much as time changes that space, but factors associated with certain theories and aesthetics can create some fixity at a certain time or place. When that happens, these factors are often overpowering. I stop seeing the three-dimensional in spaces, and I stop seeing the two-dimensional representation. I just see these factors, which in the context of that relationship, come across as intruding and distracting. I try to understand and dismantle them in locations where their presence has locked a space’s representation. For example, in photo books on poverty and the third world, or on new cities, construction and economy, I may read the introduction — statistics laying out resources against needs — yet visually, all I see is Germany’s Düsseldorf school [a group who studied at the Kunstakademie Dusseldorf in the 1970s under photographers Bernd and Hiller Becher]. Its aesthetic has become an aim in itself and the question of representation is reduced to whether a certain space can be flattened into a photograph that enhances and highlights the medium’s two-dimensionality. If it does, then it’s a beautiful place, and it’s a photograph that successfully adds more shapes and colors to the realm of the Düsseldorf school of photography. I know this sounds bitter, but I actually love the Düsseldorf school. Coastline: Under Construction #12 ; Madina Al-Ahlam; Dar Al-Quwat Al-Gawyia; Qariat Al-Atiba’; Al-Lotus. 2005. C-print on archival paper. ©️Rana ElNemr. When I worked on my Balconies Series [2003-ongoing], and after it, the Coastline Series , I took layout-like shots more than any other angle. You hardly see any elements that indicate depth in those photographs. I love that aesthetic and I found myself drawn to it before knowing of the Düsseldorf school. We are possibly accustomed to this very peculiar layout angle because of its extensive use in architectural drawings. If we stop thinking about that association to an architectural plan for a moment — and if we stop thinking about the associations of the Düsseldorf school aesthetics, which include consistency, a dispassionate approach, etc. — in photography (as opposed to drawing) this angle, where horizontal and vertical lines are perfectly parallel, is in fact a very awkward angle. I like other aesthetics too. Something I need to contemplate more is perfection and imperfection and the idea of the symmetrical. Like the moon — how I like it before it is a full moon. LA: This sounds like an attention to intuition. LA: Does awareness of references to existing schools, directions, etc. inhibit you when you’re in a space, encountering an image or the possibility of an image? REN: At some point yes — but it is an inhibition that comes after producing. In my more recent work, I have started exposing these inhibitions and vulnerabilities as part of making and reading images. I identify decisions that are strongly connected to a fear of being categorized in a particular genre or of having my work tied or reduced to its formal aspects, for example. I highlight that moment of doubt, or the questionable detail that would cause an image to be read in this or that way. This is my way of throwing my inhibitions back to the sources I get them from, and of engaging the viewer in that decision-making moment, even if the work has already been produced. It’s also a way of creating my own versions of categories that are overlapped, blended or cracked, even if only very subtly. It became known that King Marriout now has a Library, The Library Street. 2014. C-print on archival paper. ©️Rana ElNemr. Apart from looking at overpowering external obstructions, there’s the challenge of looking at my own language and means of visual representation. How do I bring in my personal experience? Do I look for the closest available codes and symbols and meanings? Do I invent my own? If so, by the time others develop their ability to understand what I mean, I am actually somewhere else already and I want to invent something else. It’s a question of time. We change, our interests and means of visual representation change, and not everything is in sync. By the time I’ve mastered a visual language and created a way for the audience to be able to read, understand or receive it, I’ve changed. I’ll be more skilled in using this language, and just about to either engage in a deeper conversation or gain a wider audience, but at that point I’m somewhere else and with another language. So it’s a struggle, but as you mentioned, intuition has some of the answer, and this is one occasion when I resort to it. LA: Let’s talk about producing a space between imagination and fragments of meaning, or a possible narrative on questions of urban reproduction, authentic architecture, desertion, livelihood and power in the case of your work on Khan al-Azizeya [an approximate reproduction of Khan al-Khalili built on the Cairo-Alexandria desert road in the 1990s]. REN: My starting point lies within the very diverse images of what that space is: how it is defined, what it promised to be and do, what it can and what it could have been and done, what it is becoming and doing, etc. Between these images, I am looking for fragments that reveal both the process of creating these diverse images and the players, roles and narratives involved. The collected images and narratives on the questions you mention and others create an interval, which is the Khan, where images that are habitually separated based on their means and space of articulation, as well as their nature, level and time of manifestation, co-exist. Inside this interval, there is little adherence to rules that normally separate our layers and levels of perception. There is room for one to come up with one’s own rules and to fill gaps with one’s own images. Accordingly, the resulting narrative thread varies in denseness, tightness, definiteness, coherence, etc. The Khan #31. 2010-2016. C-print on archival paper. ©️Rana ElNemr. 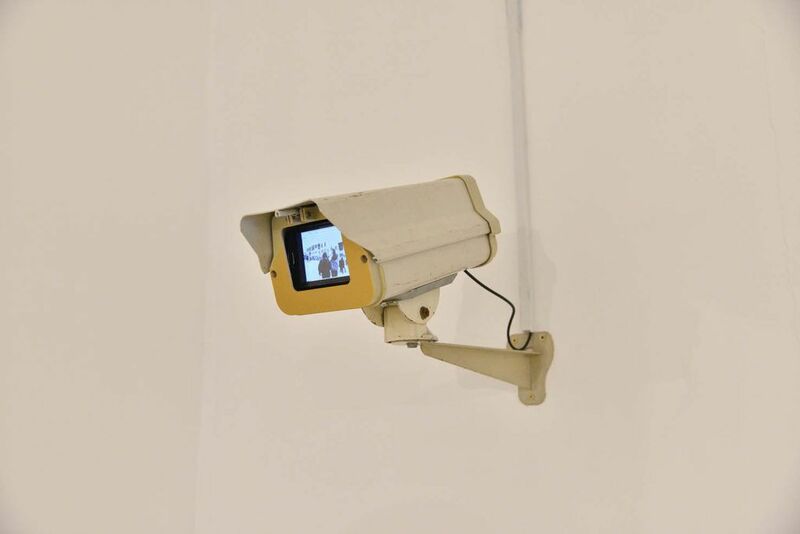 If you start from right to left in the space [of the exhibition at Beirut Art Center], the beginning of the narrative thread is a yellow and white surveillance camera. Playing inside it is a silent black-and-white video, occasionally labeled with a thin superimposed blue bar with interchanging white text. This is The Khan Ad , a re-worked version of the 1990s television advertisement created to promote the Khan al-Azizeya project for potential shop owners. In general, ads on touristy and entertainment sites grab my attention. But the images in this short video do not lay out the story of the Khan. What’s being produced in the ad are rather pictures that, besides promising prosperity and successful commercial activity, construct and reaffirm already constructed prototypes or reference-images connected to all public spaces with commercial, heritage and entertainment functions. Here the visuals are imagined and constructed by lifestyle shapers, like architects, designers, advertisers and filmmakers, who assembled the ad on behalf of powerful players in the space’s narrative — i.e. the investors and the state. The Khan Ad. 2017. Still from 1’33min video (re-worked from original TV ad, Al-Ahram Agency). ©️Rana ElNemr. In the original ad, these players explain in a simple jingle how they are good and how they want art and beauty as opposed to money. In the work, that jingle is silenced, and the 1990s TV aesthetic is subdued by removing the colors. What remains is the uncut visual sequence promising a successful hub of heritage and commerce (narrative “a”). The parallel meaning of these visuals when combined with the blue-bar-text indicates the power dynamics of image-construction mechanisms (narrative “b”). Additionally, this double narrative is hosted by an object: a surveillance camera that doesn’t shoot but screens footage. In doing this, the camera opens up avenues for various additional narratives that connect with other ads, spaces and players and that draw lines between the visual elements on display and those shooting them, those being shot, the sur-veilled and the sous-veilled. The Khan Ad. 2017. object and 1’33min video (re-worked from original TV ad, Al-Ahram Agency) ©️Rana ElNemr. After that, comes the grid of printed photographs. LA: What do the photographs, as documentary tools, do in relation to the first two narratives? Besides documenting, are they putting the process of producing images into question, in a way that opens different possibilities for the documentary? REN: This dynamic is important to relay because the function of the ad next to the photographs is not to show that there is a binary, which is the code you get sometimes with pictures of abandoned architectural space. The narratives produced by The Khan Ad take away from the photographs’ documentary power. The assumption that they represent a reality is humbled, or at least that is my intention. I say this because there is an element of weight — basically in the size, but also other factors — of the prints compared to that of the camera that is not very proportionate to the size of the narratives they produce. In a future production, I might cast a bigger camera object that plays a bigger video inside it. That way, narratives may flow much more easily between images here and there, with the aim of challenging the documentary photograph’s stand-aloneness and narrative-ownness. The Khan. 2010-2016. Installation shot, A Chapter of Synonyms 2017. C-print on archival paper. ©️Rana ElNemr. LA: I want you to try my rice, but the problem is that it doesn’t work as a standalone offering. Like your art, it needs to create a relation with something else. REN: Are you trying to curate my food? LA: Not really. But maybe. REN: I will have some yogurt on the side. LA: With the [2014 video work] The Ministry of Squares and Roundabouts, are we seeing another work interested in depicting power structures that have authority over shaping a place? And is this work exposing the messiness of this power and its production process, as opposed to the neatly produced images in the Khan, for example? REN: With many of my series, like The Khan, I found myself interested in how places are institutionally designed and invested in. I take pictures of these places as I am drawn to them, but the bad guy in them is usually portrayed in an abstract way. 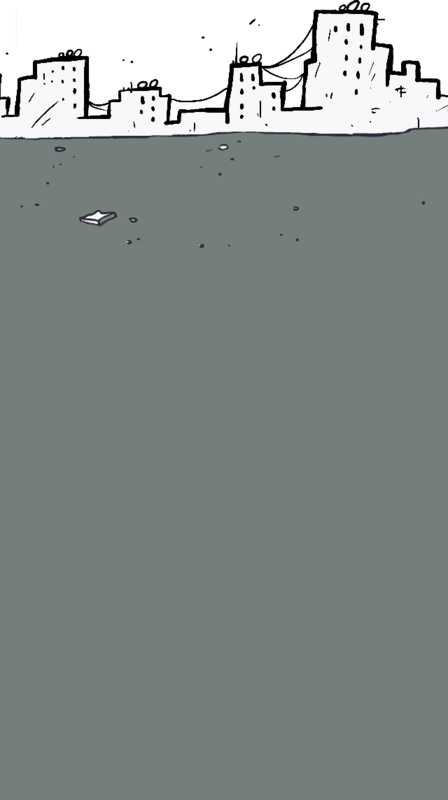 So I needed this video to be less abstract — to see the human aspect of it. LA: It is a place where the state is represented less as an overpowering evil, and more as a mundane, monotonous production machine. REN: It is below mundane. There is boredom and that is interesting for me: It is one aspect of the state I can understand, grasp and do an artwork about. I am yet to figure that out for other aspects. LA: It Became Known that King Marriout Now Has a Library  reminds me of militant urban and architectural representations that embed forms of resistance in the acts of speculation and re-use. Is this something you relate to? REN: I was working on The Khan and It Became Known that King Marriout Now Has a Library at the same time, which helped highlight parallels and contrasts in a spontaneous way. There were two points of departure for the two works. The khan was institutional, and similar in its process of creation to many other large-scale 1990s development projects, which are loaded with a vision to combine heritage and commercialization, a vision accentuated in the very distinctive branding and marketing techniques of that period. 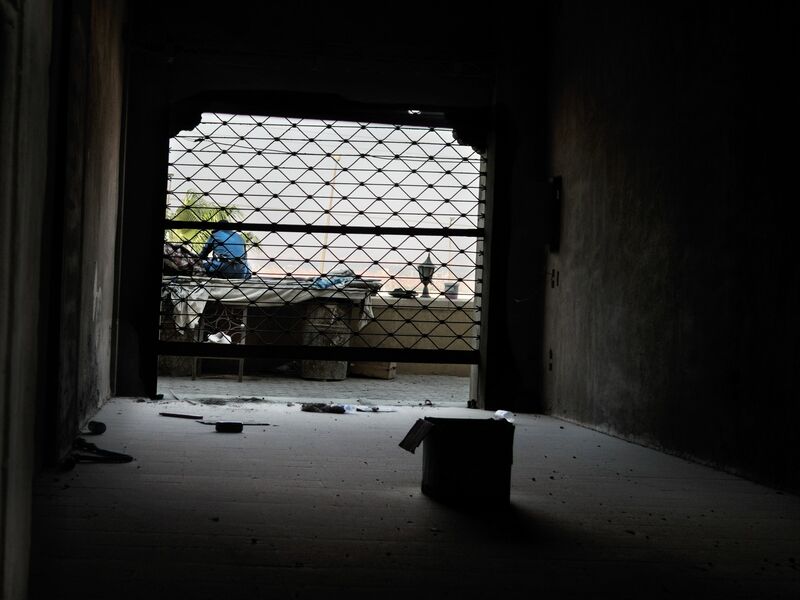 The second project is personal: a young man [Mohamed Dowidar] who wants to move away from the city and its traditional lifestyle with his wife creates a place to move to. He custom-designs it and builds it himself with some help. He researches legalities and goes through the required paperwork and procedures to install the needed infrastructure, and he mobilizes relevant individuals and parties to set up the core of a lifestyle he is striving to attain with his family. Starting with interviews and photography, I followed the development of these two places, looking at reuse, speculation and flexibility in relation to the nature of the architectural project, its scale, owner and method of actualization. In the khan, the dysfunction of what was meant to be a cultural, safe and open family space has actually drawn functions of an opposite nature for its re-use, like as a closed shooting plateau, film-sets and celebrity car-racing activities for a television program called Adrenaline. There are also other, surprising and contrasting, functions happening in the space, which constitute the body of research for my next phase of working on that project. In It Became Known That King Marriout Now Has a Library, the gradual shift in the space’s use provides an accurate reflection of the gradual lifestyle change of the family members. A house with a garden for a family of five, whose personal bookshelves outgrew the family’s living space, reached a stage where the building started to make more sense as a library. So it became a library and the family moved out to another house. In this example, the original design elements of the place lent its architecture and landscape a unique combination of integrity and versatility. This uniqueness was manifested in an ability to shift and alter functions and users with almost no constructional interference. It became known that King Marriout now has a Library #68. 2014. C-print on archival paper. ©️Rana ElNemr. LA: How did you deal ethnographically with the family and Mohamed Dowidar, since you chose to primarily work with his narrative? REN: In general, being an artist, I feel people tend to give me some space and that’s a luxury. There isn’t the fear of being misrepresented or tarnished. Sometimes there’s lack of understanding, but that’s it. I approached Professor Dowidar through his son and wife, who put me in contact with him. I explained clearly what I’m interested in, how I am doing a project on creating and recreating spaces from an imaginative picture. 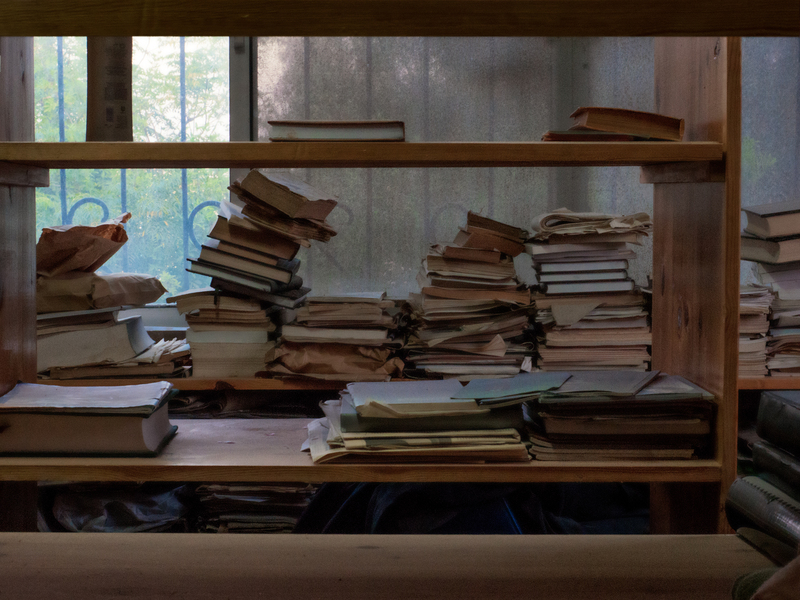 Professor Dowidar’s library has a section on cinema, and he has a music collection with all kinds of genres that he passionately describes and recalls stories of his collection process. Once I expounded on my work and previous projects, we got into a short conversation in a very organic way about art, cultural policy and history. This was our introduction to each other. We both knew there was a genuine mutual interest and curiosity. As the conversation naturally started to go into gardening, architecture, academic life and other aspects that I knew should be part of the project’s material, I interrupted and asked to slightly alter the setting in a way that put me at a further distance, both physically and in the quantity and quality of my input and engagement. I turned on the recorder that was already positioned on the table in front of him. The whole setting changed from a conversation to an interview, but Professor Dowidar was drawing connections and recalling memories that are not just sheer information. The distance I took at that point creates a definite framework for what is agreeably sharable outside the personal bonding that started happening just before. In addition, my impact on what is being said happens in controlled ways. And very importantly, I stand at a comfortable distance from all the information, feelings and characterful-ness of the speaker and what he says. That makes a subject out of him, and it makes everything he is and says “material.” This form of material lends itself much more easily to being absorbed, treated and re-worked. It became known that King Marriout now has a Library #70. 2014. C-print on archival paper. ©️Rana ElNemr. LA: Let’s talk about your use of sound in the sense of recording an interview or conversation as a formal choice. What does this do in terms of mediating your thoughts in It Became Known that King Marriout Now Has a Library, and in terms of the auditory effect on the entire exhibition? For me, this effect creates a certain livability to the show, one that is also produced differently by the lamppost [The Living Object]. Did you have concerns that using sound in this way, as in a recorded interview, would be read as too documentary? REN: I think an element of livability appears in one way or another in several works in the show: in the audio of King Marriout, in The Living Object and in The Dictionary of Imagined Places photograph . Each of the three works introduces a narrative presented by the narrative’s actual protagonist. My involvement as an artist comes on a secondary level when compared to other works. 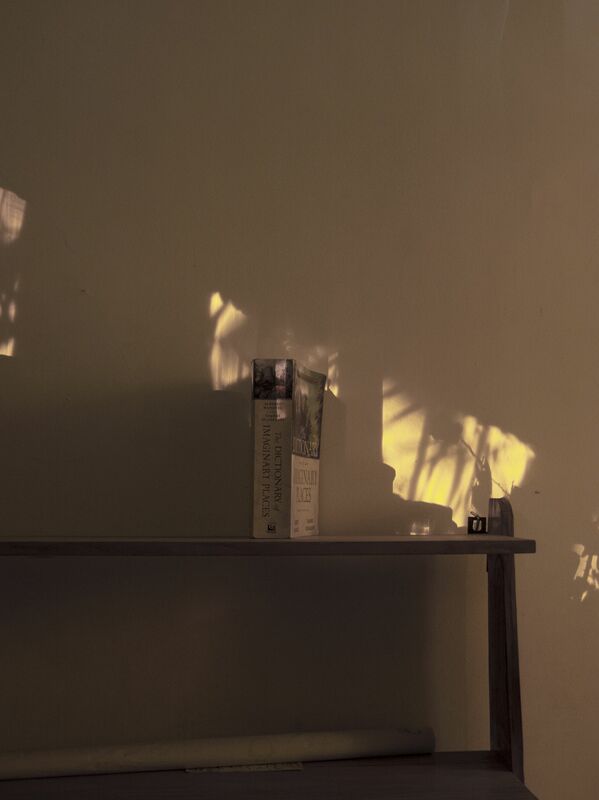 The large, 150-cm-high photograph in which the closed Dictionary of Imaginary Places [a 1980 book by Alberto Manguel and Gianni Guadalupi] stands on an empty shelf puts the viewer in immediate contact with the book, which is directly introduced by its cover, clearly readable titles and authors’ names. In The Living Object, the artist is a designer transfiguring a street object, altering its functions and cultivating crops within it, yet inside the object the living element speaks on its own behalf, through its physical living presence. As for the King Marriout audio carrying the words of Professor Dowidar, I didn’t know initially that I would use the audio in the final work. For this project, I had the audio, a transcribed text of it, photographs of the library, the garden and the family, videos of the garden and a text I wrote reflecting on some aspects of the library space. There were also quotes from books Dowidar published on economics, politics and social sciences, actual books he wrote. Some decisions are easy, like scenes that are clearly photographable or, while setting up the interview for both audio and video, I find that the interviewee’s favorite chair — where he is most comfortable talking — is visually unpleasant, so I just omit the video option from the start. So during the interview, the audio was produced as research material with the possibility of being partially used in its original form as well. It was a rich audio with very visual descriptions — some inspired me to look for specific architectural, planetary and environmental details during my second shoot, which was the following day. After editing the audio, I transcribed it and found that the material worked well in both its audio and text forms, with the audio of course bearing much more of the character of Professor Dowidar. It became known that King Marriout now has a Library #64. 2014. C-print on archival paper. ©️Rana ElNemr. LA: The sound opens a space of imagination that gets filled with a process of character development in our minds. REN: Yes. There’s also something here related to intuition — besides what I was collecting as material, I knew during the short introductory conversation that I had developed a real curiosity about this man. I do trust this feeling, so I told myself, if I have this curiosity, maybe other people will too. But back to your question about whether that form may come across as too documentary, well in principle it does for sure. But in this work, the protagonist’s voice actually does the exact opposite. Without the audio, the wallpaper and still photographs of King Marriout would come across as very documentary. The photographic medium constantly points to my presence as sole narrator. With another voice describing visuals as well, several additional dimensions are revealed and made accessible for the viewer to connect to the space. One dimension is time, but other dimensions are more abstract or intimate or ephemeral. They connect fragments from the audio to visible fragments in the photographs. They also connect them to moving and living fragments of adjacent works, like The Living Object and The Shaft, and even to fragments of a work installed at the other end of the space, the tables of plants listed in The Ministry of Squares and Roundabouts. Foreground: The Living Object #2. 2017. Plants, light fixture. Background: It became known that King Marriout now has a Library: The Library at Night. 2014. Vinyl print. ©️Rana ElNemr. LA: I like the connection between audio and curiosity. REN: In a previous piece, Depot , not shown in this last version of the work, curiosity is a key player. It is a specific kind of curiosity, wanderlust. It is a place that is almost deserted. There is no thread of thoughts or narrative. There is no road or specific itineraries to follow. You are in the middle of something where everything seems like everything, with so many imaginative moments from childhood and possibilities for making your own world inside the space. Following a butterfly, as clichéd as this may sound, may be the type of instigator for curiosity in such a space. Depot #7. 2014. C-print on archival paper. ©️Rana ElNemr. LA: How do you handle the aesthetic of decay and desertion that is sometimes prominent in your work? Do you feel that these are sites ripe with imagination, and so confidently let them preside? REN: I’m bothered by talk of decay, more in words than visually. I am definitely drawn to places where there is decay, but I don’t want to document decay. Inside the condition of decay, there are things related to the phase preceding it, revealed in ways that are interesting for me, possibly because entangled narratives are deconstructed by their own decay. I am not happy when someone reduces a project like The Khan to a work that documents decay. LA: It’s the danger of an overpowering aesthetic, but also the violence of language. REN: I didn’t want to use an image from The Khan in the poster for this reason — it would put the entire exhibition in that place. Of course, I want to understand more why I am drawn to these aesthetics, but at the same time, I get worked up when it is singled out. LA: Maybe it’s simply the usual typecasting that happens when meanings are given to things. REN: Yes. Of course the notion of decay is self-evident. But it is the visual and verbal representation of its manifestation in spaces, particularly their urban aspects, that I don’t find convincing. When decay is visually portrayed as desertion, it doesn’t only ignore the active complex process of decay, but it assumes a flat act, where the key player is always a group of people whose impact is weighed by their quantity and where their existence is reduced to physically occupying the place to make it thrive. In the next phase of my work on the khan, the few people still residing in the space hopefully provide an opportunity to contemplate and address these questions much more. The Khan #101. 2010-2016. C-print on archival paper. ©️Rana ElNemr. LA: You might be finding counter narratives to decay. REN: Parallel narratives, counter narratives and everything. I’m not trying to find life in decay. LA: The sculpture in the show is called The Living Object and it speaks to us somehow this way. It is three-dimensional. In its vagueness there is a certain fixity, and in its presence you seem to be aggregating fragments from the other works in the exhibition. While it seems to be evolving in response to the show, it is also a lamppost, a relic from a silent structure that belongs to the streets, almost an invisible one because it is so expected, though its role is to shed light. So it is there and not there. It’s there for the formal purpose of lighting and other informal purposes (like climbing, hiding, etc.). Likewise, in the show you tamper with sculpture as an artistic form and with the work as an element of the show on many levels. REN: At first, creating the sculpture was an exercise in translating meaning back into form, with some of the meanings, as you say, coming from fragments of other works in the show. Because the sculpture is site-specific, it transmits the fragments of meanings not only from visual representation to three-dimensional form, but also to the physical and non-physical surrounding context. So the form is created in response to both the meanings in/from the surrounding works, in/from the gallery as a space that contains artworks, as well as in response to the building’s physical characteristics, including its measurements, lighting conditions, surrounding buildings, etc. In addition, as you say, the lamppost comes from a street context. As street furniture, it changes upon entering the gallery space, it becomes loaded, while also dropping functions. Responding to the reality of exhibiting work in a physical space in a certain context, it becomes again a functional object, but in a different way. LA: How does it do that? REN: It is still a lamppost and the source of principle light in that room. On the street it fulfills its primal function jointly with other, usually identical, lampposts. In the gallery, its functions vary; it joins different objects and light sources and has a vague hierarchy of what functions it would perform first or most. One function is to produce a light with the purpose of partially covering that light, and so creating a shadow of an object on the wall. Another function is to manifest the transition that takes place in the space, a transition from a three-dimensional reality, which is the object/plant, to a two-dimensional representation of that reality, which is a shadow of the plant on the wall. At the same time the shadow registers as some sort of an image expanding, but also going back to the means of producing images and limits of defining representation. LA: How did you go about making the sculpture site-specific? REN: Being on the first floor of the building, the lamppost doesn’t just sit on the floor, because of the rules of gravity. It’s as if it is coming through the ground; you get an illusion that it started on the ground floor and is going through the ceiling through the entire height of the building. It’s a constructional relation to the space. 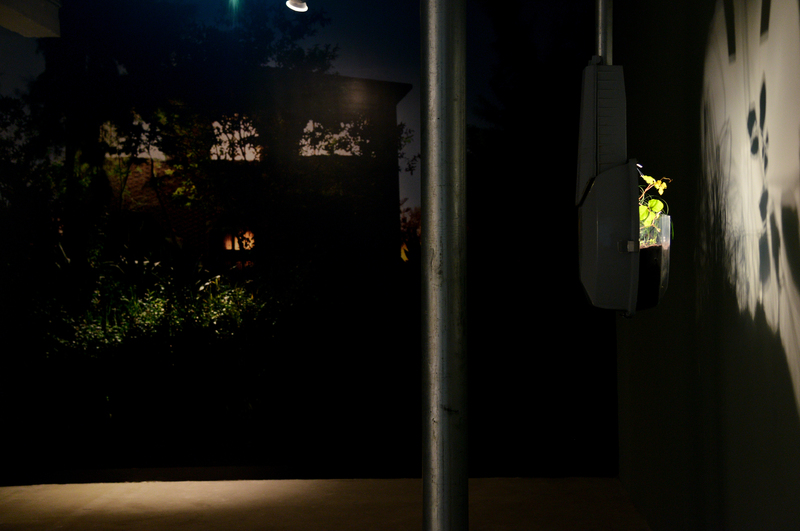 In the first version of The Living Object in 2014, the sculpture had two lights. One, positioned in its standard angle, lit the floor underneath it, and the other one, a meter and half higher, created a curve and faced the wall. In the second version, I omitted the standard light facing the ground. This was the work’s evolution, because that light was no longer functional in the new exhibition space. I only needed the light source that created the shadow. 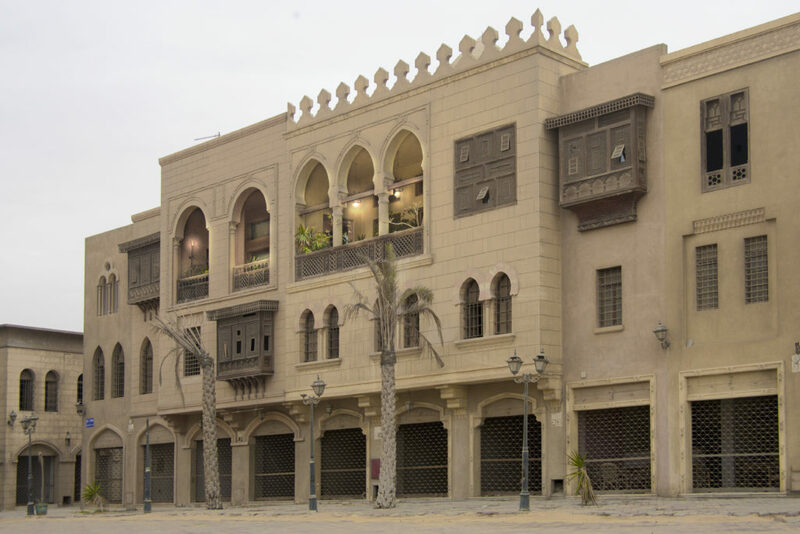 In its earlier iteration, the object was created in the context of New Cairo, a desert extension of the capital city, in the new campus of a university where a lot of construction was still happening. Its integrity mattered in that context as it was an independent structure, and it was important to get that feel. The reason I mentioned evolution when one of the two lights was dropped is that the work now more sharply serves an artistic function. Foreground: The Living Object #2. 2017. 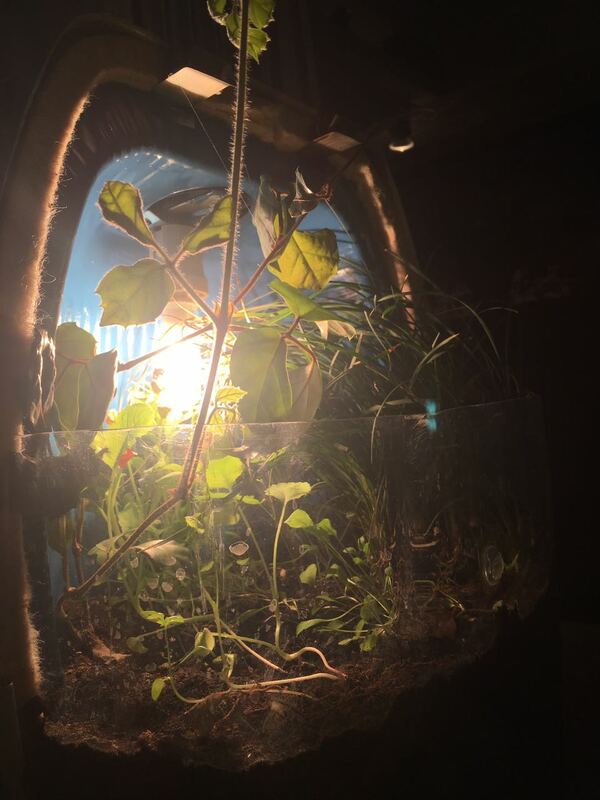 Plants, light fixture. Background: The Shaft. 2014. 16mm Film transferred to video. ©️Rana ElNemr. LA: What about sculpture as an artistic form with its own baggage? Have you experimented with it before? REN: I don’t have any training in creating three-dimensional objects. I’m usually drawn to this medium not in the context of art in galleries, but in the streets with all kinds of sculptures and statues. I made paper sculptures in iterations of The Balcony Series and The Olympic Garden [2009-2010]. I started with the simplest elements within a medium, like a sketch, note or photograph. Then while working, a build-up happened in the form of layers, in the form of expanding the limits of the medium I started with, and/or in adding a new medium. Foreground: The Olympic Garden II. 2010. Paper. Background: Detail from The Olympic Garden I. 2009. 3-channel video, text, audio. ©️Rana ElNemr. LA: You also approach dimensionality as an important key to how we see. REN: Yes. The important point is that there is usually a smooth transition from one dimension to the other, like from the two-dimensional to the three-dimensional. This is maybe possible because of the pace of my work, since my projects are long-term. I’m not sure I have answers to questions on mediums and their specificity, because when following a line of thought or addressing a certain issue, formats, mediums, genres and all means of communication become relatively fluid, and I move freely and organically across mediums for at least some time during the production phase. LA: So your use of form is organic to the process? REN: Yes. And in this organic way in which the medium is introduced, I make conscious choices, but not from within the form. Labels and judgments related to art forms can be limited and problematic, such as when a form is associated with a particular function or with addressing specific issues. Equally problematic is when an art form is called ancient or outdated or propagandist in a generalized form-specific way. In the case of The Living Object in relation to my practice and to this specific show, I was working on spaces, meaning and representation, and I was using images and addressing the practice of image making. From this standpoint, the medium of sculpture opens up possibilities for different perspectives of imagining, projecting, representing and defining aspects, functions and conditions for a space. When relieved from the baggage of the medium, one can borrow elements from a form to address the subject. LA: The lamppost also creates a dialectical relation with sculpture as a fixed form, that has some sort of an end, despite being three-dimensional: There is light and shadow born out of the lamppost. REN: Yes. And the choice of what is created, or what is creating the shadow, manifests yet an additional dimension. A plant that grows according to the rules of nature creates a constantly changing shadow or image. It expands the sculpture into the dimension of time. The Living Object #2. 2017. Plants, light fixture. ©️Rana ElNemr. LA: This is goat labne as well? REN: Yes. I forgot to open the jars of pickles. LA: Let’s go to the pigeon video, called The Shaft [2013-14]. The shaft is a source of light primarily, but in the local context, the Arabic word [manwar] is used to mean many things in a housing setting. It might be the place where the doorman lives with their family. It is sometimes a dump. It’s the place that balconies and windows assigned for hanging laundry face (as opposed to street-facing balconies). It is somewhat a negative space. So we have here a relation between space and meaning as well as loss of meaning. REN: This play that is the shift between space-to-meaning and meaning-to-space seems like an exercise I do to activate and sharpen various senses and parts of the brain and perception methodologies. Going back and forth with this shift is not primarily an obsession, nor a form of meditation through repetition. It is rather because throughout that process, there are only very rare moments when some elements come in sync, and when that happens, there is potential for a slightly more articulate meaning or a newly assigned visual or an additional sensation on the edge of a perception or experience. In the context of art, this intensification is found a lot and it can be the product of self-indulgence and obsession. While I enjoy it, part of me becomes critical of it. But it’s only through that exercise that some details emerge. 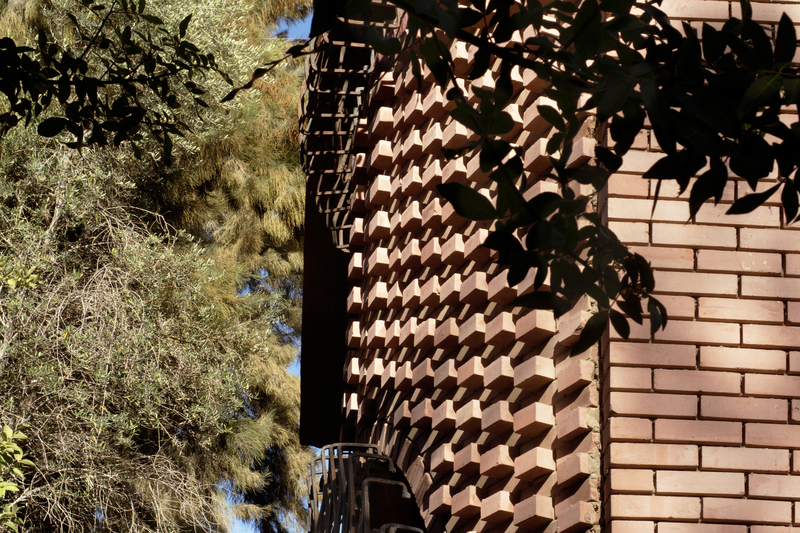 LA: Repetition is a space that can create the possibility of meaning. REN: It certainly is. I go about it by doing it, by not stopping myself from doing it because I’m bored or because I want to move on, or because I’m questioning the importance of repetition. What’s interesting about the shaft for me is the notion of negative versus positive space. It is the center of houses and it’s the negative space around which there is the positive space. Energy usually comes out of the center, which is the positive space, while the negative is outside. So the relation between positive and negative seems to be reversed, and that is interesting. The film focuses on this negative space and it doesn’t show much of the positive space around it. There’s also a vertical movement inside the shaft, with pigeons flying up and down. And then a horizontal movement around this space, emanating from the houses. So it’s a circular activity around this vertical light well, that stands on the ground. I find this interesting. I need to capture the links in this story. LA: It might be an interest in the relations between spaces, ones that are fixed, well set in stone, and the different things happening around them, that are less accounted for, which is a core theme in your work. REN: Yes. The shaft idea usually doesn’t articulate itself in writing for me. My ability to talk about my works, in a way that makes sense, is derived from accumulated conversations about them with different people. They made me gather the vocabulary, the understanding and the links. Part of this is related to the fact that people connect works to some of their references. But with The Shaft, no one has told me anything beyond the fact that they loved it. LA: Might it be a question of intimacy? People identify with a space that is quite intimate in their everyday, but at the same time forgotten or taken for granted, so there are not many words to say? REN: The thing is that people don’t quite recognize it. A few times I was asked, where is that? So people don’t feel the intimacy you refer to. The framing of the film makes the space unknown. There’s no reference to how big or small it is. LA: Let’s talk about the relationship between your work and text in general, and in light of deliberate parts of the show, like The Dictionary of Imaginary Places. REN: Sometimes, when I’m struggling to go from place to meaning, or into other trajectories, like from the visual in the work to its articulation by language, I tend to use the visual in a more abstract way. This is why I would suggest a drawing when I am unable to provide a text. When you abstract, you can see certain things and walk certain paths, instead of the disorientation of being all over the place. But there is also a part, whereby although this work is complete and I show it and I am happy with it, I know that I am not able to say something specific about it that doesn’t screw it. I feel the work would be more complete when language is balanced with the visual. If it is working perfectly visually, but I am unable to talk about it, it is clear to me that there is something missing and that’s an exciting thing because it is like a knot that I want to go to. LA: What else about The Dictionary of Imaginary Places? REN: I was looking into what people do when they get bored and found that sometimes they read. When I was thinking about it and trying to do research, I came across Alberto Manguel who wrote A History of Reading, for which there is an Arabic translation. It was very interesting. Then I came across another one of his works, The Library at Night, which categorizes all kinds of libraries, ways of dealing with libraries, types of categorization, etc. Then I found a third work, The Dictionary of Imaginary Places. I decided to buy these three books seven years ago. I read The Library at Night and A History of Reading together. But The Dictionary of Imaginary Places stayed a long time with me not able to read it. I traveled with it to different places, and it’s a big book. It took me years to realize that it is it, the book itself, and not what’s inside it. I clearly see the point related to intuition here: that the impact of the book, besides its content, lies elsewhere. I am coming and going with it, and it is doing something to me. REN: Yes. I put The Map and The Dictionary of Imaginary Places as the introduction of the exhibition. It’s the first thing you see. The Dictionary of Imaginary Places. 2014. C-print on archival paper. ©️Rana ElNemr. LA: For The Map, I want to ask you about a certain reference. At some point, mapping and cartographic practices infiltrated the art world. I’m curious about your consciousness of this. REN: Technically it is a garden plan, a floor plan, a layout view. You can call it many things and “map” isn’t the first thing that comes to mind when describing it. But I like the word “map” because it brings associations of discovery. There is clear information, like details about seeds for example, but there are also many unclear indications, missing information and unexplained preferences for certain marks, patterns and colors. It makes one interested to know more about the space, which opens it to the other works, to the relationship with meanings and definitions, and to the garden space itself. 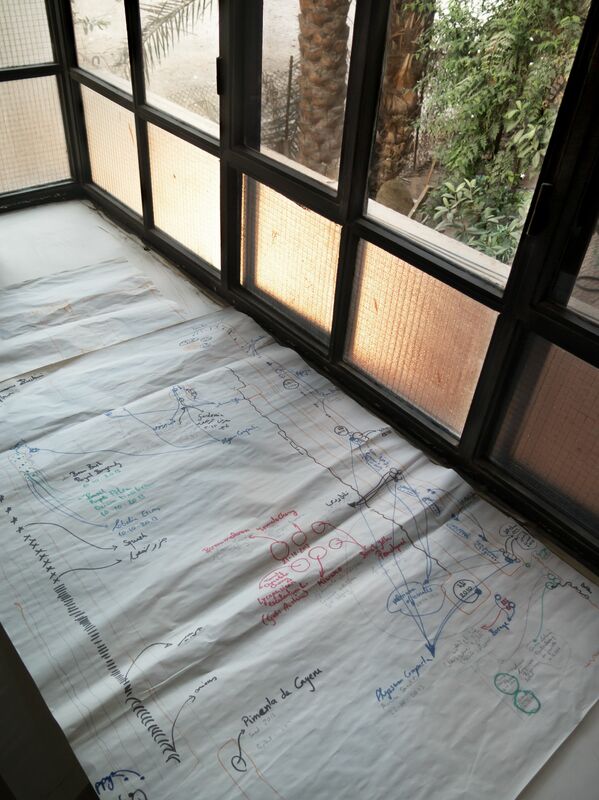 Now that I’m thinking, all my work is possibly connected in its processes with maps, whether this shows in the final work or not. The Giza Threads started with some accurate mapping. In my series The Metro, in 2002 and 2003, I was walking along two metro lines in a very consistent way. With The Balcony series, I point the location of each balcony on a map. A map is like a back-end in my work. It is one of the grounds on which I stand to create perspective and find connections to address different issues. But there is also lack of a map. In Depot, which is not shown in this exhibition, what’s interesting about the space is that lack. It awakens a curiosity whose scope of anticipation is far wider than it is in a mapped or drawn space. Wandering around aimlessly and without a structure, which lack of a map may cause, is actually an encounter between the space and some of our less used sensory, emotional and mental drives, or at least less used in association with spaces and discovery. Similarly, or in connection to this, a sharpened system of observations and instincts reveal a huge range of levels and shades within the spectrum of what is accessible, what’s intimidating, what’s secure and so on. The Map. 2013. C-print on archival paper, hand-drawn garden plan. ©️Rana ElNemr. LA: Do you feel sometimes that overt referencing of critical theory or discursive literature in general in some art practices hinges on parasitism? REN: It’s a plausible critique. LA: On a more basic level, do you fear sometimes that there are certain inevitable significations to your works associated with their visual heritage? Or do you take solace in the fact that your field of visual interest, including spatially, belongs to the margins? REN: Sometimes there are things I like to photograph that can be very clichéd. But I’ve developed some mechanisms. There are things that I photograph as part of the process that have nothing to do with what I will show or how I’ll show it, and between these two phases the interesting thing happens. When I am photographing, there are questions of clichés, ethics and other things all the time. But I go ahead and photograph, because for me I already saw. I don’t see the difference between what is in the camera and what I see, although I am aware of the difference. For me, it’s a chance to later contemplate the difference between this image and the closest image to it that I will comfortably show. There can be several versions of being comfortable with showing: There is comfortably showing, there is proudly showing, there is intellectually stimulating. This comparison makes me deal better with the photographs. In some cases, there are formal solutions to clichés, or other solutions related to framework. Sometimes, there is no solution. LA: You have the exhibition mindset like a curator? REN: Not while I produce the work, but definitely in the editing and post-production phases. LA: And the relations between the different works? REN: At the risk of complaining too much, I find that many multiple-work shows, whether group or solo shows, come across as mass produced. I mean, the relationship between the works does not transcend a small range of topics that are constantly repeated, and an even a smaller range of connection types. In many cases, that does not stop an interesting work from standing out, yet it limits its potential to connect with other surrounding works and with its viewing audience beyond the pre-established framework and conceptual note. LA: How do you go about following a curiosity you have around a subject of interest? REN: In no particular order and depending on the nature of the subject, my first inclination is usually to physically explore the subject physically, through my senses. If it’s walkable or drivable, I’d do that extensively. If it is tellable as a story, I’d hear it again and again and look for diverse accounts. In addition, I collect pure factual information, and I note the nature of the source of this information. I surf the web in a random and probably intuitive way, and I come across writings, images, movies and interviews that vary greatly in their degree of seriousness, popularity, depth, style and in my own opinion of them. For example, I sometimes listen to threads of TEDex talks about one particular subject or spend days reading very commercial travel blogs. Most of my knowledge of critical theory is derived from following practitioners who implement it, as opposed to obtaining it in pure knowledge form. Speaking about pure knowledge, I wonder sometimes whether what one arrives at through readings and more readings in addition to observations is the same or different than what one arrives at through practice and more practice in addition to observations. It puts into question the way in which art as a parallel approach is capable of making propositions the way critical theory does. I am aware that saying this, I am separating worlds and approaches that may not necessarily be so separate and may very well overlap successfully. Assembled in Streams of Synonyms, the Text. 2014. Text on archival paper. Details from It became known that King Marriout now has a Library. 2014. C-print on archival paper. ©️Rana ElNemr. LA: Where does the audience feature in your production process, if at all? And if it does, how does it feature? Do you wonder how they will receive the work? Are there imaginary conversations with them that directly affect the face of the work? Are they invisible until you actually interface with them during the public moment of the exhibition? Do they provide some references of thinking, or directing what work to make next? REN: The audience is there indeed. Not all the time. It’s quite funny, asking me to describe them. During the production phase, it’s accurate to describe them as the accompanying voices. I shut them off sometimes, but other times I embrace their presence. Sometimes I call them for help and yes, certainly lots of imaginary conversations take place there. The clearest form they appear in is that of a voice repeating something I’ve heard or read before, about my work or about an aspect of a different work I identify with. On many occasions, I use their physical voice to question what I’m doing or ask for clarification and justification. I answer them in my voice, then I use their voice again to challenge my answers. I probably also use their voice to share a moment of satisfaction with some aspects of the work, yet there’s no guarantee that I wouldn’t use their voice again to disapprove and act destructively. But anyhow, I enjoy the conversation a lot and I wish there was a way to record this silent but quite focused and articulate discussion, and then play it out loud — as opposed to recreating the whole conversation in front of a real audience. For me, the performative aspect with a real audience can be awkward. So that’s when the voices are there, when thinking about form and approach and my position as an artist. But they are certainly not around at the phase of curiosity. I have no idea where they are during that phase, and I never remember to ask. 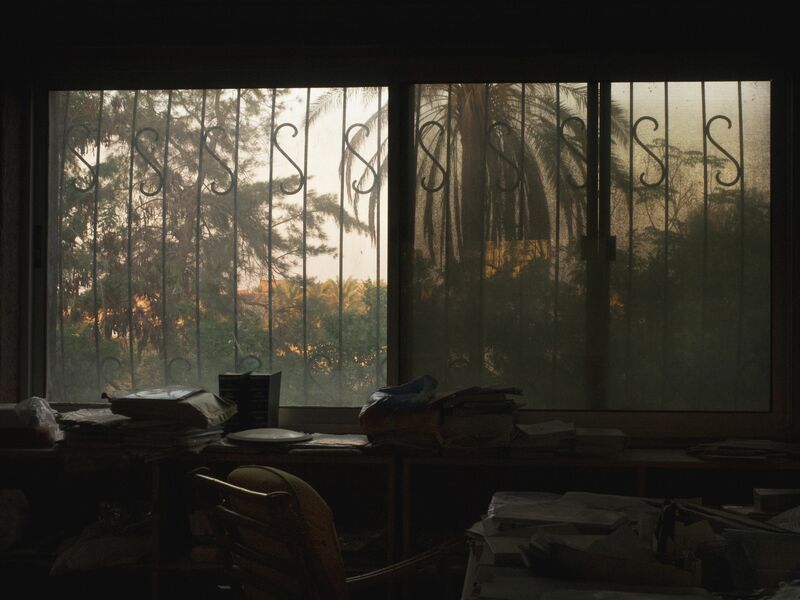 Lina Attalah | Randa Shaath on showing in a contemporary art gallery and the battles of working in Egyptian newspapers.